The right hand half of the 1902 Muston School photograph - George Challands is the thoughtful child seen 4th from the right in the second row from the front. 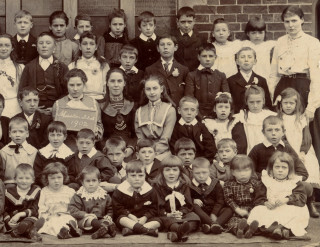 Walter Challands in the 1902 Muston school photograph. From the private collection of Mr. Alan Hodgkinson. 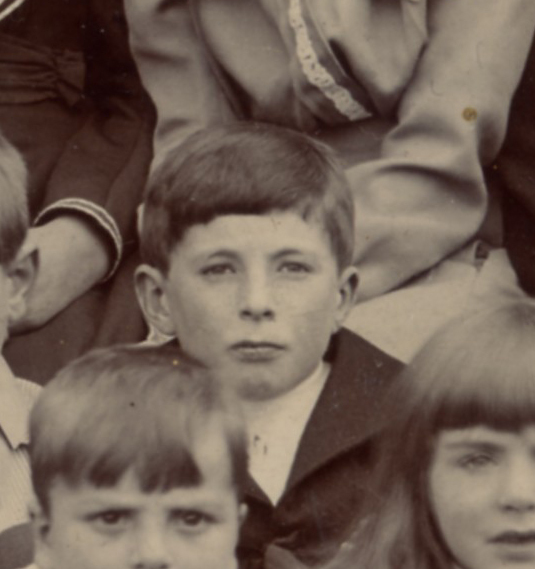 George Ernest Challands was born in 1893 in Muston, the older of two sons of William Challands and Sarah Challands. William Challands, his father, was an ironstone labourer, born about 1864 at Muston and died in 1953 in the Grantham area. His mother, Sarah Challands, nee Burton, was born about 1865 at Cotham, near Newark: the couple married in 1893 within the Grantham area. George’s brother, their younger son, was Walter A. Challands, born about 1896. In 1901, they lived on Woolsthorpe Lane, Muston, next to the home of Isaac Johnson, who is remembered on the Muston War Memorial. It may also have been the same house that he returned to after his miltary service, but this is not certain. In 1911, George Ernest was a 17 year old wagoner, one of four farm servants at Burgin’s farm at Foston, Lincs. George Ernest Challands joined up at Melton Mowbray on the 10th October, 1914, and was posted as Private 2843, 1/5th (Reserve) Battalion, Leicestershire Regiment. He was given a new service number, 240790, and on the 8th March 1915 was promoted to Lance-Corporal. 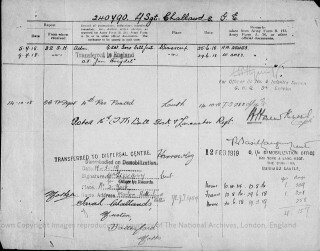 Despite this promising start, he was to remain in England until the summer of 1916, when on the 13th August he finally arrived in France, to join his unit five days later. He was promoted to corporal on the 3rd November, 1916. He spent a week in hospital in France in December, 1917. 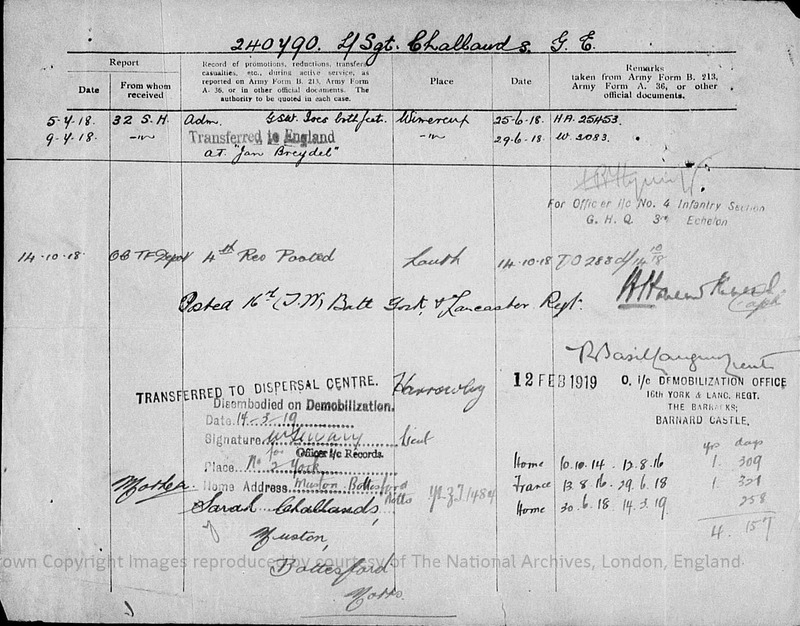 On the 4th March, 1918, he was posted to the 170th Tunnelling Company, and was classified as a ‘bomber’. On the 1st June he was promoted to Lance-Sergeant, but three weeks later, on the 23rd June, he received shrapnel wounds to both feet and was admitted to 32nd Stationery Hospital, Wimereux, then on the 29th June, 1918, was transferred to the War Hospital, Keighley. His medical report says of him, “This NCO walks on the inner side of his foot and is at present not fit for long marches”. He was kept in England for the rest of the war. On 14th October, 1918, he joined the 4th Reserve Battalion of the Leicestershires at Louth, and was then transferred to the 16th (T.W.) Battalion, York and Lancaster Regiment, with service number 59811. He remained in England until his discharge from the army on the 14th March, 1919. The 1/5th Battalion was a Territorial force first raised at Leicester in August 1914. It became part of the 46th (North Midlands) Division, which took part in major battles on the Western Front from 1915 to 1918. However, referring to George’s actions in March-June 1918, the Tunnelling Units were part of the Royal Engineers. Wikipedia records that the 170th was involved in fighting major fires in Bethune in April 1918. This was when the town, in the Pas de Calais, came under severe German bombardment during the ‘Ludendorff Offensive’ and suffered extensive damage. Lance-Sergeant Challands was awarded a War Pension of 6s. per week. He was also awarded the British War Medal and Victory Medal. The injury to right foot required further treatment in 1920. The electoral roll for Spring, 1921, indicates that George Ernest Challands was living at Brigg’s Cottages, The Green, Muston. He married Agnes Topps, daughter of Henry Topps, at Muston on the 18th September, 1924, and stayed at Brigg’s Cottages. Next door lived George’s parents, and the cottage on the other side was occupied by John Edward Challands.Walter lived close by at Cherry Tree Cottage. By 1929, George and Agnes had moved to one of the Council Houses at Woolsthorpe. They were still in the Council Houses in 1939, living at No.12 with their daughter Vera (b.1927) and George’s 75 year old father, William. George Challands died in in the Grantham area (Woolsthorpe, probably) in March 1955, aged 62. 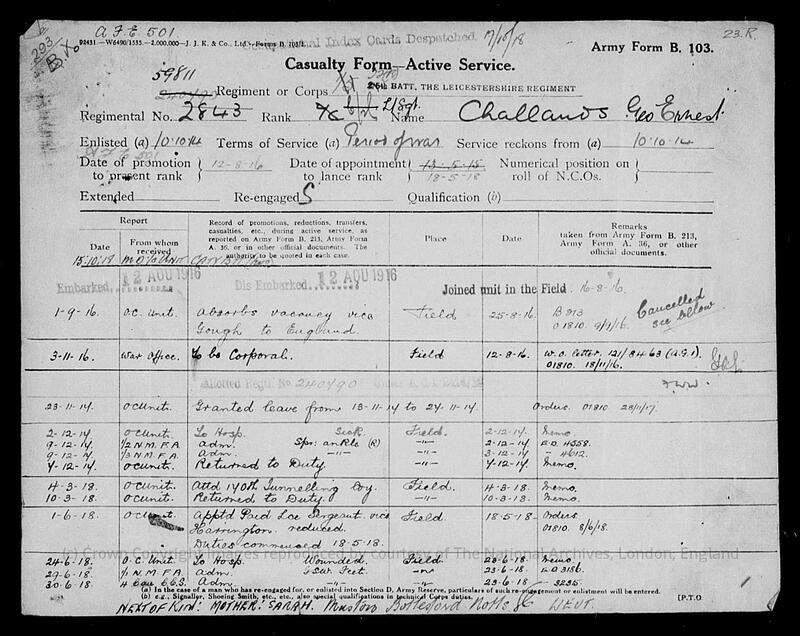 Footnote – George’s younger brother Walter Arthur Challands may well have enlisted, but this has not been confirmed. 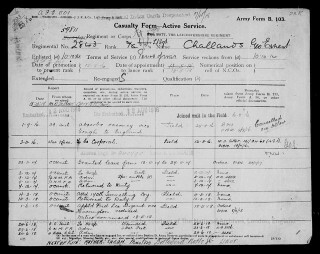 There is a Medal Index Card for a Walter H. Challands, date of birth not given, who was 31909 Corporal Somerset Light Infantry. There is little reason to believe this is the man from Muston, though it is just possible that the ‘H’ might be a transcription error for what should read ‘A’, but this remains and outside chance at best. On the 15th August 1923, Walter Arthur Challands married Lucy Topps, 26 year old daughter of George Henry Topps, at Muston, St John the Baptist. In the 1939 register, They were recorded living with Nora (b.28th September, 1928), probably their daughter. The address is given as Cherry Tree Cottage, Green Lane, Melton & Belvoir RDC. 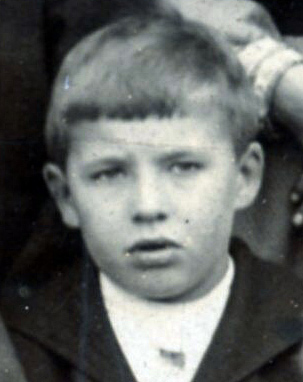 Walter Arthur Challands died in 1975, and was buried on the 13th October at Muston, 79. When he was ‘disembodied’ on the 14th March, 1919, he had attained the rank of Lance-Sergeant and had been transferred to the 16th (T.W.) Battalion of the York and Lancaster Regiment.